Nick Kyrgios & Bernard Tomic have uphill battle in beating their toughest opponent, the National Psyche. But no matter. We’ve helped them out. Brass-tacks. Nick Kyrgios is a bit of a dill. Bernard Tomic too. But, while that head of yours in nodding in too right agreeance, know they’re also victims. Of us. Those two are suffering terribly at the hands of a truly Australian condition. Tall Wattle Syndrome. And sure, they’ve only themselves to blame. 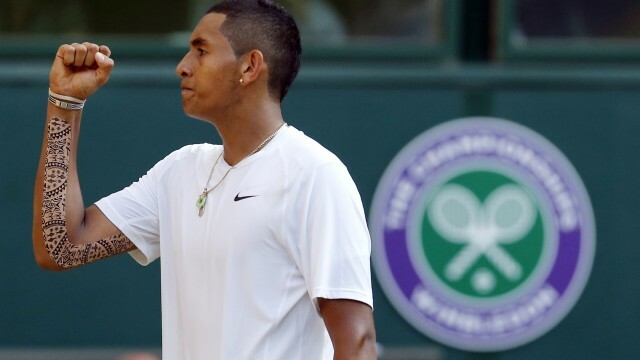 What with Kyrgios carrying on like the drunk at the Wimbledon barbeque, wowing everyone whilst simultaneously burning bridges in classic Australian verve, but by then it was over and the Gas(quet) was shut off, he needed to be taken home. Immediately. Ditto Tomic, who’s continual shenanigans need no specific introduction, he’s our Coca-Cola, a recognisable trademark. It explains itself. Which poses the larger question. Can you be successful, and also be a dill? The answer, historically, is no. Ever since forever we’ve placed a premium on being alright. You can be rubbish, but as long as you behaved properly, and had a go, the result itself would be irrelevant. We’d love you. Nicholas, Bernard. Heed the lessons of those who have ignored these sporting commandments, those who excelled beyond our wildest dreams, but came up short in the personality stakes. Two examples that come to mind are Donald Bradman & Cadel Evans. Champions, sure. Achieved impossible feats, yep. Good blokes….ehhh. They were promptly dispatched with a congratulatory nod, and a swift exit to the arms of our better heroes (see: Bradbury) And we were right to do it. There’s nothing worse than a Champion who knows it. Which is the root cause of the Kyrgios/Tomic humdinger. They fail the test. Ludicrously talented, yes. Saviours of the sport, yes, have them over for Chrimbo lunch?…ehhh. But! History also shows there’s hope for Messrs Tomic & Kyrgios. Look no further than Lleyton Hewitt, considered by all and sundry to be the most Australian Australian in world sports, with his penchant for gutsy performances and the sweet fruit of Summer Bay; in his formative years, shockingly, was a bit of a tool. Even future PM Michael Clarke, prior to him becoming every father’s preferable son-in-law, was also considered a bit iffy. 1) Don’t admit that you’ve won it. If they ask you how it feels to win, deny it. Change the subject. 2) Ignore the interviewer. Offer a quick hello to your mum instead. Accept your prize. Not the trophy, no. Nor the money. The endorsement you’ll earn will be in the hearts and teary eyes of all of us. Endorsement as a True Australian Champion. And Australia, even if they don’t change, get behind our boys, love them like champions. It’ll piss Dawn Fraser off.